From Florida's west coast comes the sun-soaked American League East Franchise: the Tampa Bay Rays. For the ultimate D-Rays fans, we have the custom official MLB merch for you to mount in your beloved fan zone. 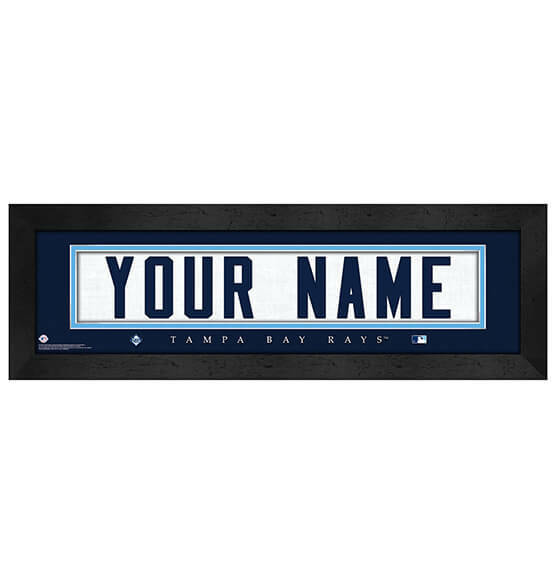 This fantastic Tampa Bay Rays Personalized MLB Nameplate Framed Wall decor will be displayed proudly in your home or office thanks to the high-quality printing, elegant frame and its convenient, ready-to-hang sawtooth hanger. Designed to look like the back of a Tampa Bay Rays jersey, our personalized nameplate is guaranteed to be a dinger!